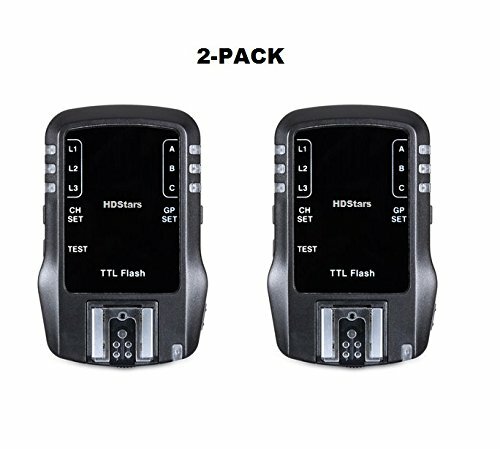 Trigger flashes wirelessly with this 2-pack of TTL Wireless Flash Transceivers. Compatible with TTL cameras and with added support for and communication protocols this set will function well with many flash units. For usage, one transceiver slides directly into the hot shoe and utilizes a 2.4 GHz frequency with a range of 328' to trigger the remote flashes mounted on the other transceiver. A variety of features have been added in the model, including support for group ratios and multi flash. The transceivers also have a hot shoe and PC sync port available for mounting a flash unit or connecting to a strobe. When connected to a strobe, a Super Sync function will allow photographers to achieve a faster sync speed than generally possible with their camera. Additionally, there are both TTL and manual flash modes available for full creative control. And, it can utilize 7 channels and 3 groups for setting up multiple flash units easily and efficiently. The Transceiver Utilizes a series of LEDs to display settings and allow users to make adjustments. On the device is also an AF assist beam to help in low-light conditions. Multiple sync modes are available for more specific needs or effects, including 1st and 2nd curtain sync. A high speed sync mode is available when a flash is connected via the PC sync port and will help in bright lighting conditions and for stopping motion with a maximum speed of 1/8000 second. Additionally, the transceivers run on 2 AA batteries each. 2.4 GHz FREQUENCY with a RANGE of 328' to TRIGGER. 7 CHANNELS and 3 GROUPS: For setting up multiple flash units easily and efficiently. AF ASSIST BEAM TO HELP IN LOW LIGHT CONDITION. A HIGH SPEED SYNC MODE: Is available when a flash is connected via the PC sync port and will help in bright lighting conditions and for stopping motion with a maximum speed of 1/8000 second.